As a community-based organization, we are dedicated not only to helping the community through the variety of services we have to offer, but also by directing individuals to other organization and services that may fit their needs. Below are some additional resources for homeowners, renters, or those looking to purchase a home. 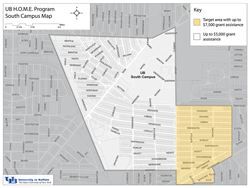 Click for a full-sized map of the UB HOME Program area. UB H.O.M.E. is a purchase assistance program that offers full-time faculty and staff up to $7,500 towards down payment and closing costs, or the buy-down of a point of interest on the primary mortgage, for the purchase of a home near the University’s South Campus. The goal is to encourage faculty and staff to pursue homeownership within close proximity to the University, in an effort to help support, stabilize and revitalize campus neighborhoods. The UB H.O.M.E. financial assistance will be in the form of a combination deferred and forgivable loan that requires no monthly payments. Provided that the buyer remains owner-occupant of the assisted property for a period of 5 continuous years, a portion of the funding is forgiven. The balance of the funding is due only after you sell or transfer title to the property. Below are two resource directories for the Delaware and University Districts They contain information about the Housing & Human service our agency has to offer as well as Common Council Member information for each district, other Community Based Organization’s information, banks, unemployment services, lead awareness programs, other housing organization, and much much more. Please select a link below to view the directory.